After last year’s difficult goodbyes to the Muraleando project, we questioned throughout the year whether we would return so soon, yet here we are again! I was sitting in the studio in Winnipeg one day working away, random music playing in the background when all of a sudden one of my favourite Cuban tunes started to play. By the end of that day and after an easy talk and arm twisting session with Terry, we were booked. It had been a very trying year for me personally this year with my father in Thunder Bay encountering some major life changing circumstances, but after numerous trips back and forth, he was finally settled and stable, and I could finally regroup and where better than in Havana! Everything about that city stirs and heals my soul – the music, the art, the people, the architecture and the streets …my list is endless! Our visit was shorter this year, and unfortunately we were both a little under the weather for a few days, but we made the most of it. I conducted two workshops for children in a smaller but very interesting new community art project in Havana known as Proyectongo. It is a small group effort headed by my dear friend and talented artist and teacher Yoan Barrios. He brings his past experience in the Muraleando project and his love of art, back now finally, to the children in his own neighbourhood of San Franscisco de Paula in Havana. 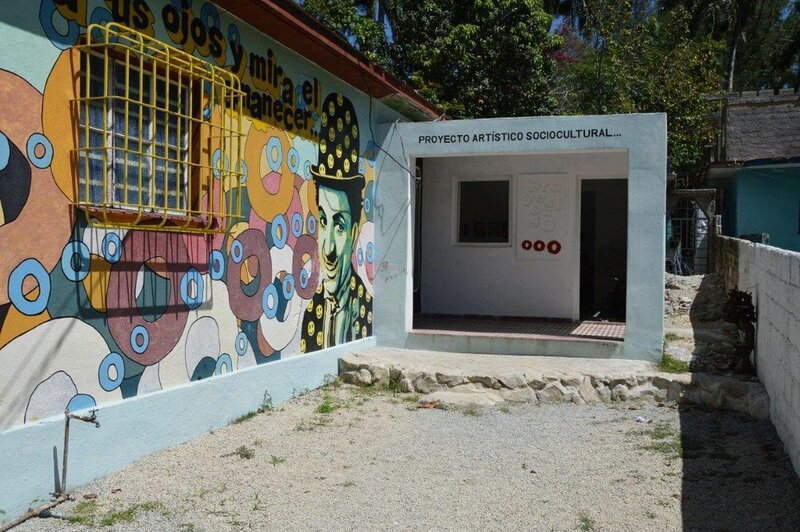 In a short period of time, Proyectongo has established itself as a true community social art project, and has been given much well-deserved support from other artists, the community itself and the local government. The University of Havana has also taken note and this year awarded the project with well-deserved recognition and gave them a distinguished designation as a remote pilot site for the arts program of the university. It is the intent of Proyectongo to remain relatively small in order to be able to provide the best programming possible given the skills, space and resources that they currently have within their reach. They have a small but manageable working studio and space for workshops and instead of tables for the children to work on they have clipboards…but it works. It’s a place to start! Of course Yoan Barrios and his supporters have dreams of a larger space but for now they are content with building a strong and reliable presence in the neighbourhood. My workshops with the children were wonderful. I was blown away by the talent in this young inexperienced group. I decided to tackle sculpture this year for the first time and was a bit nervous but the results were fantastic. The best part of the workshops, are always the end when parents come to pick up their children and see what they’ve created. I always look forward to the look on the parent’s faces when they arrive – disbelief and pure joy for the opportunity their children have just had. And even though I wasn’t planning to conduct a workshop for women this year, I had brought along some supplies to leave, so at the last minute I decided to join them for a sock/doll-making workshop….they looked at me like I was nuts when I told them I wanted them to make something that didn’t look pretty! I was trying to stretch their creative imaginations! So, as long as I am still going to Havana in the future, I will continue to do what I can, where I can. 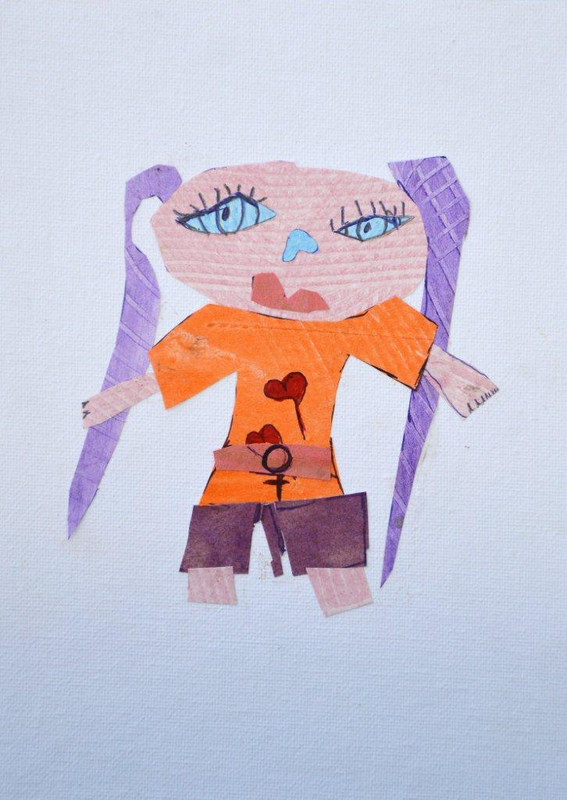 I especially love being able to connect with the Cuban children through art. They are always so respectful and appreciative of having an international visitor come to help, and so surprised by what they can create with a little guidance and a few more interesting supplies other than Crayolas! And, don’t get me wrong Crayolas are great…I encourage anyone visiting countries such as Cuba to fill whatever space they have left in their suitcases with art supplies, and find a community project or a school to which to donate them. One small gesture like this can make a huge difference and bring a lot of joy to these children who have had so little. Nine years after my first encounter in Havana in the little-known barrio of Muraleando it felt somehow different this year. As I arrived and walked down the street towards the community centre which we helped build I knew this might very well be my last. Perhaps it was fitting then that this phase would end with a beautiful symbol representing what brought me to the project in the first place - the children! Since last year’s workshops, I have been working with the images created by the children in the project, to self-publish a Spanish alphabet book titled “El ABC”. The book was produced and printed in Winnipeg and was made possible with generous financial support from private donors there including the staff and partners of LM Architectural Group. 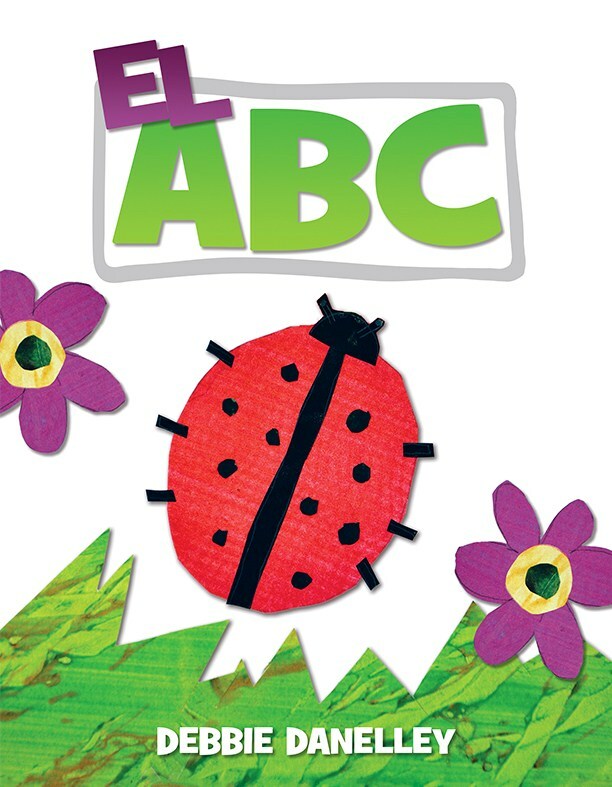 “El ABC” was unveiled to excited children and proud parents at the opening ceremony of this year’s festival in early April. Copies were distributed to all of the children who took part in the previous year’s workshops, but also to workshop assistants, artists and others in the community. A generous supply was also left for distribution throughout the year and to use as an income generator for future children’s programming long after I leave. After nine years of laughter and tears it was finally time to say goodbye to the project. To the many incredible people we have met throughout the years who we now call “amigos”, we only say, “so long for now”. Year 8 almost didn’t happen! Due to the huge rise in tourism from the US, we almost didn’t make it to Havana for the annual international arts festival in the neighbourhood this year! We were finally booked to arrive in early May, a month later than usual, but my dear friends on the project decided to change the dates of the festival this year to coincide with our arrival! We were very excited this year to see for ourselves, how much if anything had changed in Havana since last year. Cuba was certainly in the news more than usual this year and the media suggested that Cuba is changing and therefore the lives of the people of Cuba are better! There is a quote from a Cuban blogger “... Cuba is more a headline than a reality!” Yes, things are changing. There are signs of infrastructure improvements, new hotels under construction, new restaurants popping up everywhere. But in my opinion, the only people really benefiting from all of these “changes” are the American tourists they are targeting. The average Cuban’s life is not any better...in fact in general, it is probably worse. Food is harder to come by because there are more tourists’ mouths now to feed and even if you can get to a market at the crack of dawn to try and get what you need, the prices are higher because they know they can get it from those who need produce for the businesses who cater to the tourists. The kind of change that is truly needed in Cuba is not going to happen overnight and busloads of American tourists are not necessarily going to make everything better. But don’t get me wrong, I am sincerely grateful for the tourists coming to Havana and in particular to the community project in which I am involved. I had the opportunity to speak with many who visited the project this spring, and they were all lovely, interested, caring and generous individuals. As usual each year my main involvement during the annual festival is to provide art workshops for the kids and others in the project. This year I conducted two workshops for both younger and older children. The first was with the older kids making Paste Papers. 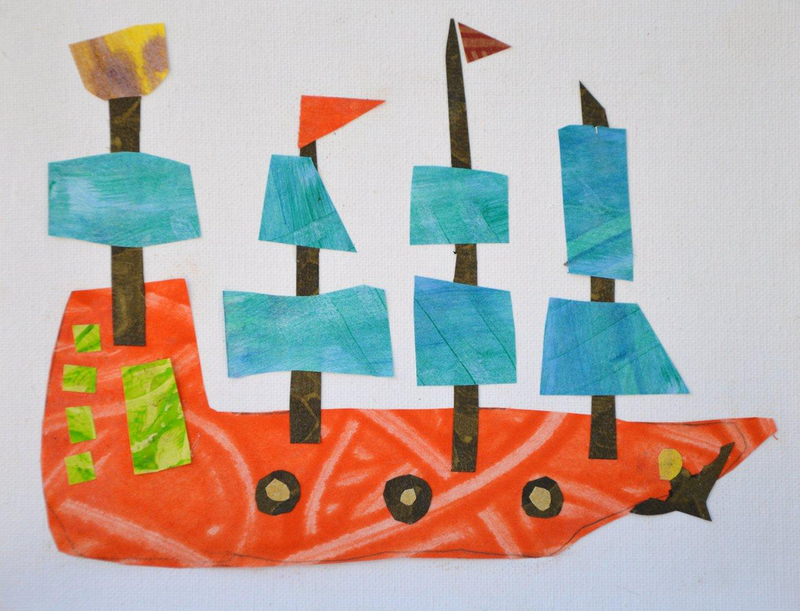 They made 50 large sheets of decorative papers with paint and a variety of tools to create colour, pattern and texture. The second workshop was with the younger kids, and their task was to use those paste papers to create specific collaged images on canvas boards. The intent of these two workshops was that of a collaborative effort by the children to create a Spanish alphabet book which I will be self-publishing this year with the help of a company in Winnipeg. All of the images were carefully photographed while I was there and I’ll soon begin the process of creating the book back here in Winnipeg. 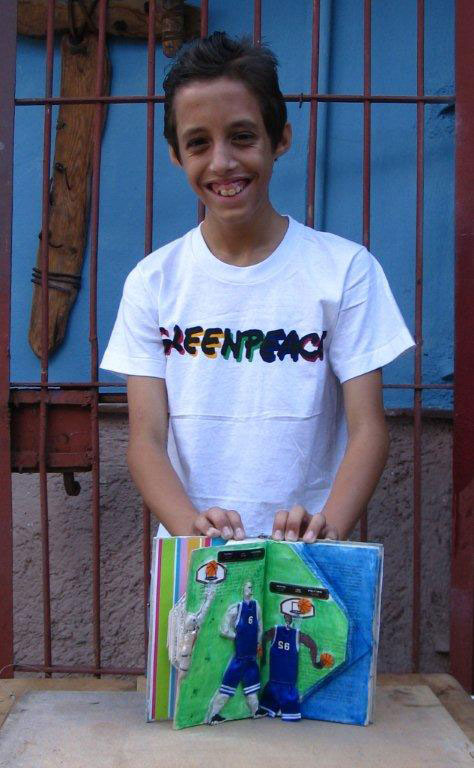 My dream is to be able to print at least 200 copies with the intent to bring one back for each of the children who participated in its creation, copies for the various schools in the neighbourhood, and then to have some as well that the project can sell in El Tanque to visitors to the project. The money raised from those sales will go directly back into programs for the children throughout the year. That is my plan...cross your fingers for me that I can make this happen for them! I also gave a mini add-on session to a bookmaking workshop being conducted by one of the project artists. He asked if I would teach the grandmothers/women’s group how to make paste papers as well so they could then use them for the covers of their Japanese stab-binding books in his workshop. Much to my surprise the women really got into the paste paper process and it was hard to get them to stop! As I have found many times in the past when working with my Cuban friends, they are always so grateful and eager to learn anything new, even if it is outside their comfort zone. Another big part of the annual festival, especially in the last 5 years since the El Tanque community centre was built, involves new construction on site and new outdoor art installations and murals. Although just as ambitious as in other years, this year, things were definitely busy but seemed a bit more relaxed than usual...everyone still worked hard every day for the two weeks of the festival and boy was it hot this year! …. but I realized now that after five years of intense and focussed experience learning new skills and ways of working with different materials, they were becoming skillful craftsman as well as being talented artists. Also because of the success of the project in general, they are now able to provide employment for a few skilled labourers from the barrio to help with some of the more complicated construction tasks! 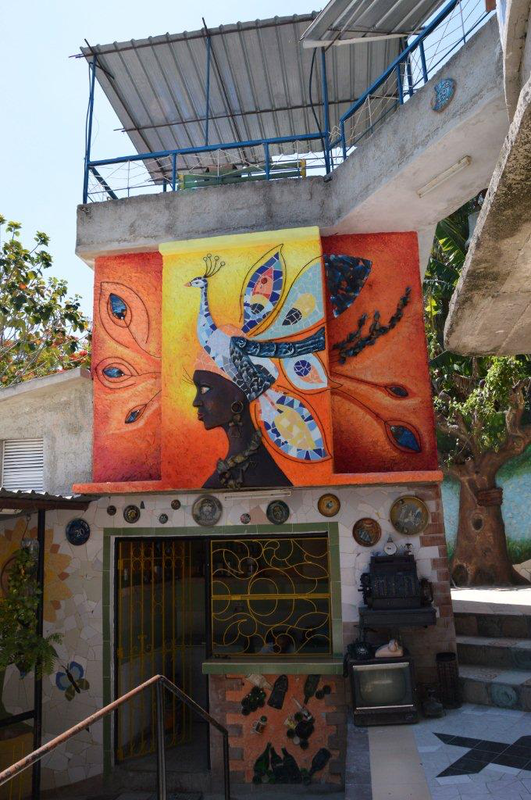 So this year was also a momentous year for Muraleando – they celebrated their 15th Anniversary for the Project itself, the 10th Anniversary of the Annual International Arts Festival, and the 5th Anniversary since the unearthing of El Tanque and creation of the community centre. To most who visit for the first time, it may appear like they have always been there...As you enter the neighbourhood it is filled with murals and evidence of years past, but the reality is that most of what the tourists now see when they arrive by the busloads daily, is really the result of the last five years! And once you really wrap your brain around that and what you are seeing and experiencing when you are there, it is unbelievable what this small group of people who started with nothing but their time, hopes and a dream were able to accomplish in this small, impoverished barrio of Havana! I am so blessed to have been able to see this happen and to realize the power of good intention, not to mention the power of art to transform lives!!!! Thanks to all of my friends and family near and afar, who have helped support my efforts again this year, I could not have done it without you all! Un gran abrazo!! This year was lucky #7 for me…. more about that later. What an interesting year it was as well with all of the recent international discussions going on between Cuba and the United States....everyone was curious to know if things were already changing in Cuba as a result. 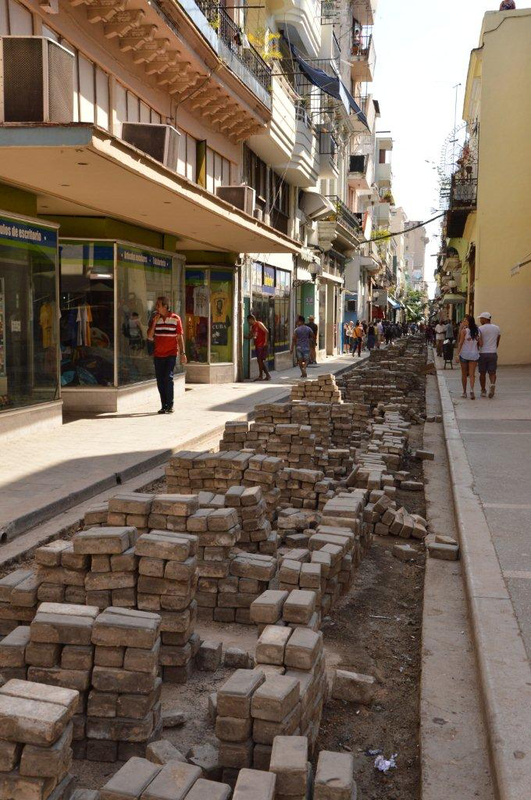 Other than a noticeable amount of infrastructure updates visible in the streets and badly needed hotel construction going on, it appears on the surface to have not changed drastically, and in speaking with many Cuban friends they will confirm this generally to be the case. 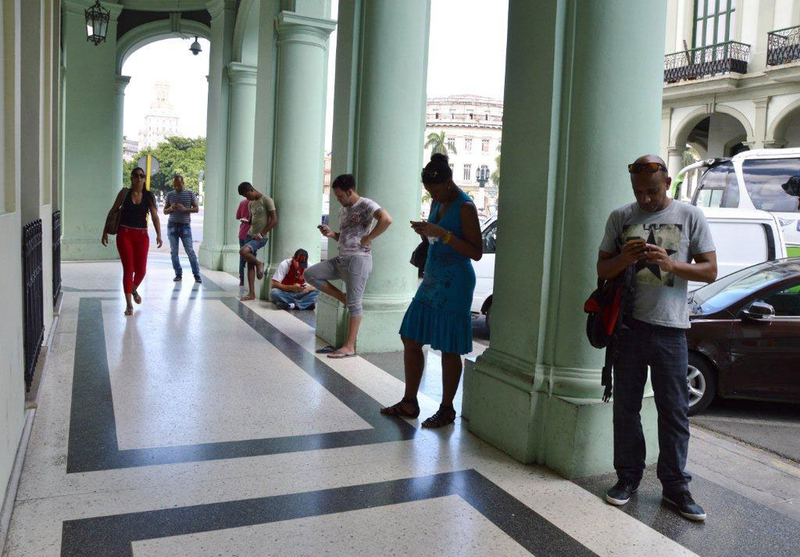 One thing that I did notice though, was that there were a lot more Cubans walking around with cell phones this year. 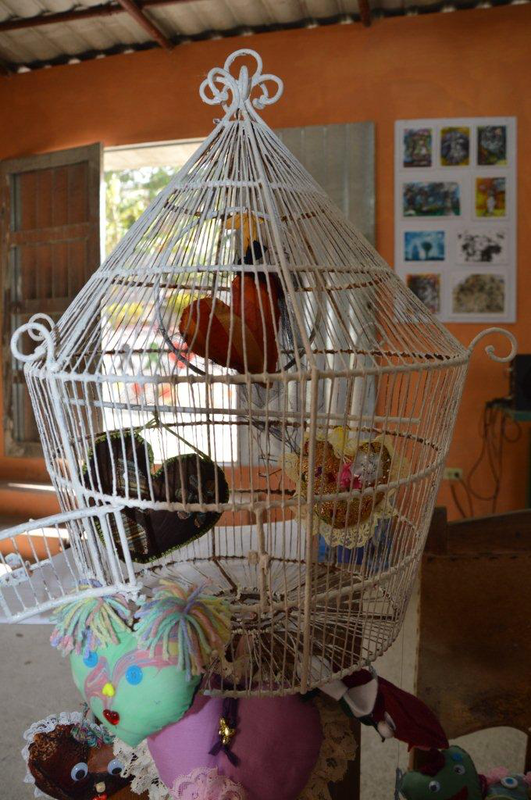 Every year during the April “Arts Encounter” a number of arts and construction related projects are initiated in or around El Tanque, the neighbourhood’s community centre. A new staircase leading to a second entrance into the facility was constructed this year, followed by street-scaping, new sculptural installations, mural work etc. It never ceases to amaze me how much work gets accomplished in a two week period. Another very noticeable change was the non-stop tour buses visiting the project on a daily basis, sometimes 6 times throughout the day and evening! And yes, most of them, American tourists. I spent a lot of time as the Canadian “ambasadora” talking, dining and dancing with the tourists visiting the project. My unique perspective from the last 7 years was the main topic of discussion during dinner tours. I met a lot of very interesting people from all over the United States who were absolutely thrilled to have the opportunity finally to be there, albeit still not totally free to travel on their own to or in Cuba, but very interested and eager to learn about Cuban culture and people. Of course my main responsibility each year is to provide art workshops for the community during the festival. This year the focus was on jewelry making for the most part, with the exception of the grandmothers’ group. One workshop was given to the younger children where they made beautiful seed bead necklaces with hand-printed cork pendants. 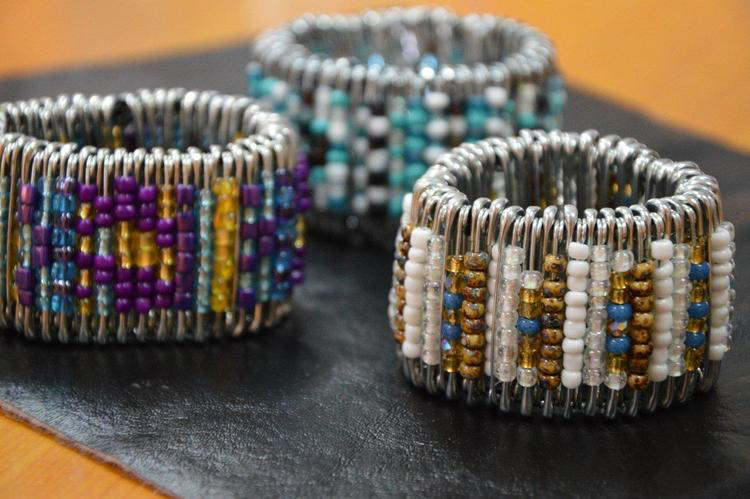 The second workshop was with the older teens and they made stunning paper bead bracelets which required a little more hand dexterity. But the primary use for most of the materials was focussed on a small handpicked group of artists who were invited to a two-day workshop on basic jewelry making techniques. I created kits which were presented to each artist with enough supplies and tools, not only for the workshop but for many months to come. The grandmothers’ workshop this year was the largest to date.... I love this group. As a special project we decided to create a small but permanent installation for one of the classrooms on the site to showcase to visitors and others in the community what the group is all about. The group decided to make embellished hearts out of fabric that I later incorporated into an installation involving a beautiful found birdcage. As the years go by I continue to do what I can to help this community that has become one very large extended family. And each year the moment I return, I am already thinking about the year to come, and the “gathering” begins yet again for all of the supplies. And special thanks this year go out to my major “corporate” sponsor, LM Architectural Group for their continued support and to the Air Canada Foundation for their help with Baggage Allowances this year. People always say to me that what I do is amazing, but the fact is, that I would not be able to do what I do, to the extent that I do each and every year, without all of the support from everyone. So, besos to you all and un gran abrazo! Remember at the beginning of this update I mentioned it was lucky year #7 for me..... well at the Closing Ceremony of this year's Arts Encounter, I was introduced to Cuban curator, Magdalena Rivas from the Galleria de Arte, Luz Y Oficios. She invited me to participate in an International Exhibition she was curating in July, which included artists from Cuba, Germany, Colombia, Spain, and Italy. So upon my return at the end of April, I began work on 6 new Meditations on Landscape/ Havana pieces, specifically for the exhibition, and in July I was back in Havana for two weeks to attend the opening of the exhibition at La Moderna Galeria in Centro Havana. 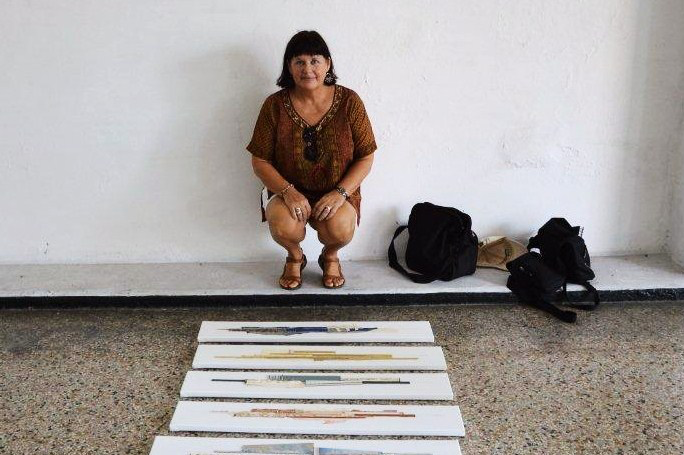 I was also invited to participate in an artists’ talk, which allowed me to present other work from my portfolio and to meet other Cuban artists and hear about their work and struggles as professional artists in Cuba. Well this was Year 6 in the Muraleando art project and this year’s two week arts festival was probably one of the most intense I have experienced to date. It continues to grow in leaps and bounds, and recognition continues from the Cuban government and tourist agencies from all over the world. Practically every day, one, two or sometimes three tour buses arrive one after the other, to experience a little bit of everything that makes this project special – its art, murals, outdoor sculptural installations, the community centre itself, affectionately called EL TANQUE (a restored 100 year old water tank), and then finally, an up close and personal musical experience with a local songbird and the her back-up band consisting of artists, musicians, and anyone else from the neighbourhood who happens to stop by on any given day. 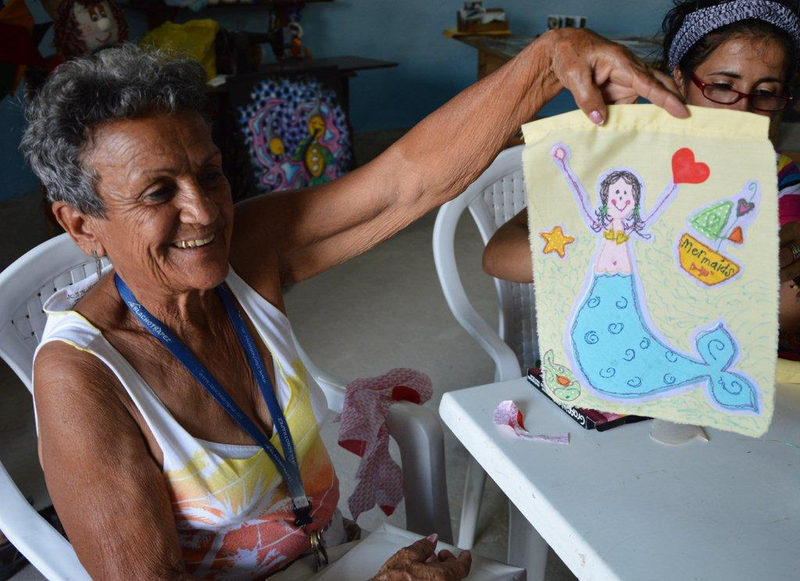 During the festival I conducted art workshops for the women and grandmothers group, children, teens and the local artists who are the creators, builders and truly the foundation of the project, in this small barrio of Havana. I also threw my back into some ceramic mosaic work on a 30 foot long bench in the centre’s garden....hard work but I loved it. The festival also drew two artists from Germany and one young woman from Britain who has been working in Bogota, Colombia. Each year during the festival period one day is totally devoted to the kids in the community. It is a “FUN DAY” packed with all sorts of typical Cuban activities – street races, a tug-of war, blind-folded boxing, and board games, all done in the streets amidst people, cars, horse drawn wagons, etc. All of the children receive small prizes for participating so as you can imagine it is well attended. A pencil, hair barrettes, elastic band bracelets, odds and ends left by tourists and myself to distribute to the community are handed out after each activity to eager and grateful little hands. It is like a mini Christmas for the children. 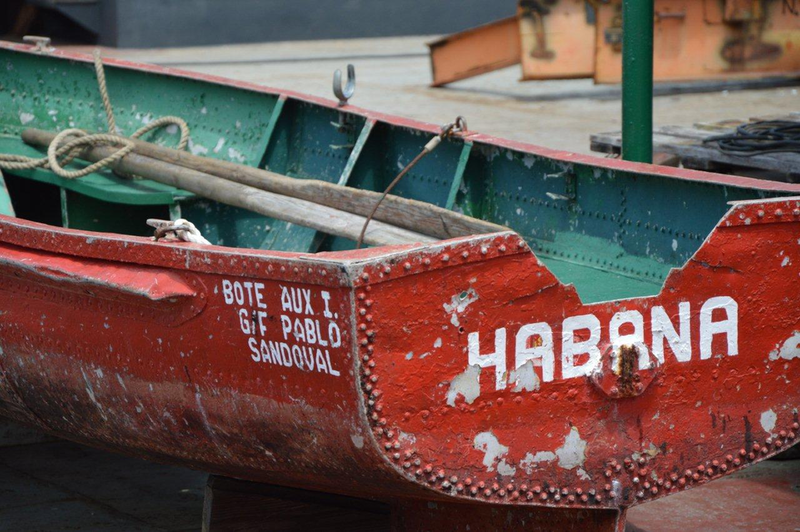 A highlight for me this year was an invitation to join a group of artists, musicians, children and the project co-ordinators on a brief three day road trip, to an area about 2 ½ hrs outside of Havana – in the province of Mantanzas. We visited a few locations but our main purpose was to spend time visiting a small beachside town in Cienago de Zapata. Here we were hosted by a couple who are trying to develop a similar type of project in their area. So our bus arrived and immediately we unloaded, set up the band and prepared for a fun first night of music, dancing, and singing that attracted locals and tourists as they strolled along the beach....our artists also completed a mural for their centre and some sculptural work on the beach side while a couple of others including myself conducted free workshops for the children of the community. The first workshop was an origami box-making workshop with about a dozen kids, and the following day, I did a simple beading workshop which had now attracted about 25 participants... word travelled fast.. and by the end of the afternoon we had mothers showing up and using every excuse possible as to why they too needed to make a bracelet. It is amazing what a big bag of beads and elastic thread can attract and how much fun you can have. And here I thought I was finally coming along for a nice relaxing trip to the beach! Actually I wouldn’t have it any other way. I love doing this for these kids who have so little. Needless to say, before I left I had already promised our new friends that I would return. Help has so often been generously given from back in Canada but now its coming from further afield. Special thanks go out to a lovely woman I met last year from Washington DC. I believe her introduction to me was “Hi I’m Elizabeth, I own a bead company, would you like me to donate some stuff! !” Well she came through but there was so much amazing material I needed to do it justice and plan some workshops around her supplies for 2015! There are many other individuals too numerous to name who have supported me each and every year and I just want to say thank you, thank you, thank you, and to send all of you Cuban kisses for making this project the success it has become. This year marked my fifth year of working with the children, artists and others in the neighbourhood. Two good friends from Winnipeg joined me this year on the project and were welcomed with open arms and hearts by my Cuban friends and it did not take long for them to fall in love with the culture and spirit of this vibrant community. El Tanque continues to be a major hub of activity in the neighbourhood. During the day it is busy with labourers and artists working on a never-ending list of construction activities and creative installations. Late afternoon through early evening it is full of children who attend free after-school programs in music, dance, theatre and art. The rooftop of El Tanque was completed this past year and has become an outdoor party sight for special events and visitors, with live music and dancing under the beautiful Havana sky and stars....it is quite magical. Tourists visiting the project are almost a daily occurrence...they are coming on cultural bus tours from all over the world to experience a bit of what Cuba, Havana and this neighborhood has to share. I wanted to do something a little special this year to celebrate my 5th year in the project, so prior to leaving Winnipeg I held a workshop which resulted in the gifting of 30 beautiful prayer flags , with the simple idea of sharing prayers, love and support from a community of friends here to the community in Havana. Prayer flags were also made by children, grandmothers and artists of during my workshops here, using many mediums such as markers, paint, fabrics, beads, buttons and printmaking. Most of the Cubans had not been exposed to this Tibetan tradition of prayer flags so it was a completely new concept which they embraced. Some of these prayer flags were then gifted back to me to be shared with others on the grounds of a Winnipeg church for all to see during spring and summer. While I was there, Muraleando was also host to artists from Germany, Mexico and California, so it made for a lot of interesting cultural, social and creative exchanges. I was surprised at the closing ceremony when they revealed the reason for a large installation that had involved a number of artists while I was there. It was a beautiful three-dimensional concrete wall relief of a tree complete with a nest and eggs and bearing many fruits of creativity done by the children prior to my arrival. This impressive installation was dedicated to me by the community in honour of my 5th year of volunteer work here. I knew that something was up because I kept asking what it was all about and in return I got lots of vague answers and strange looks suggesting there was a language problem!! Hard to believe it has now been four years that I have been going to Havana to volunteer. Each year I have witnessed firsthand the progress made in the project but this year was something quite remarkable. The artists and new recruits from the neighbourhood have continued the work on “el tanque” and the results are spectacular. This site has become a vibrant hub for all of the children in the neighbourhood along with their families, to attend artistic workshops of all sorts, special events, concerts, etc. The interior walls of the tank itself have become a gallery and backdrop for the artists and children to show their creations to the community but also to the “turistos”. Because of the recognition this project has received from the Cuban government, the major tour operators have now included the project as a must-see destination for visitors to Havana! 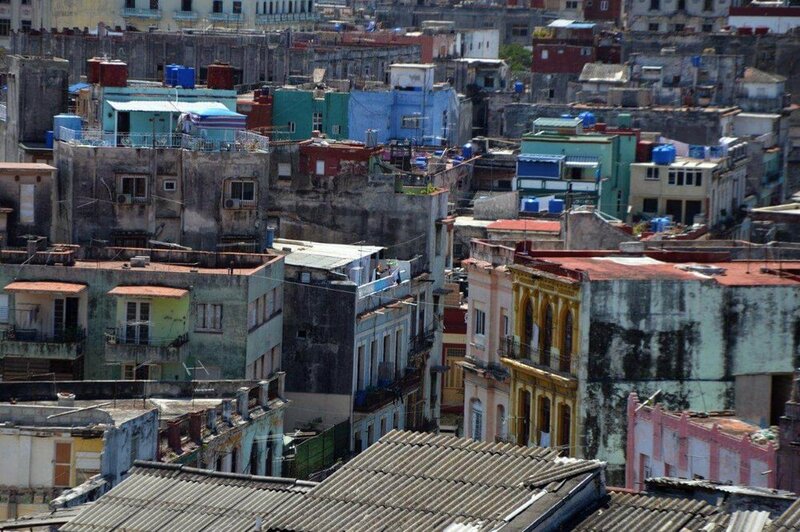 This means that at least twice a week, a large tour bus rolls down the roads of this neighbourhood and unloads a bus full of eager tourists from all over the world, hoping to get a “real” Cuban experience and connect with locals outside the touristy streets of old Havana. Since I'm now being introduced as their “Canadian ambassador to the neighbourhood”, I had an opportunity to talk to a number of the tour groups that arrived while I was volunteering this year and I loved the chance to boast about this project from my own perspective. The best part for me is that I was able to speak to them in English which is always a welcome break from my usual “spanglish”. Although I have the best translators made available to me when I am giving workshops, no one is around 24/7 to translate, so language is still a huge issue. I am fully able to get by while I am there however I absolutely long to get to know people in much more depth than I am able to at present. Each year we all vow on both sides to learn each other’s language more before our next encounter but it is difficult for us all to find the time. This year’s workshops were unique and well- received. I conducted workshops for the children, the artists, and this year I finally had the delightful opportunity to work with a group of grandmothers whom I had heard about in the past but never worked with personally. They are a small but active group who get together bi weekly to make dolls and objects by sewing both on machine and by hand. The grandmothers made goddess doll necklaces with beautiful fabrics, colourful threads and beads. I gave the artists the printmaking workshop they had asked for last year, and finally, the children and I worked on a collaborative installation using screening material, beads and wire which now hangs prominently in the courtyard of “el tanque”. As always I am incredibly grateful and happy to say that all of the materials for the workshops were brought with me from Canada with plenty of extra to leave behind, but the biggest “moment” of the week was when I laid out about 20 pairs of reading glasses on the table at the grandmothers’ workshop!! Those who needed them were absolutely thrilled and any leftovers were scooped up by some of the aging artists who were so grateful that I realized again how something so small can mean so much to these people. the start of something Big!! Here I am once again to share with you the highlights of my week of volunteering in the Muraleando community art project. According to my Cuban friends my Spanish is slowly but surely improving which I hope confirms to them that I am serious and committed to continuing my work with the project. This year was the 10th anniversary of the overall project and it was very exciting since they were given access to a 100 year old concrete water tank buried in a hill in the neighbourhood. Why is that such a big deal you may ask? Well, this would be the start of a dream being fulfilled, for a community arts centre where workshops can be held, supplies stored, meetings conducted and festivities to take place for all in the community. The project was given access to “el tanque” in February and by the time I had arrived it was ready for me to conduct the first workshop in!! The artists had to shift their creative volunteer hours to heavy duty construction work, but they did so and will continue to do so until the vision for “el tanque” is complete. As always, workshops were conducted; this year I gave 4 workshops – one collage workshop for the younger children which resulted in an accordion style book, 2 workshops for older children which introduced them to relief printmaking on linoleum and provided each of them in the end, with a portfolio of prints from fellow students, and finally an interesting handmade book workshop for the neighbourhood artists involving india ink and introduced them to some basic bookbinding skills. The artists however, were very envious of what the older children were doing in the printmaking workshop and asked me to consider a workshop like that for them next year!! It was very exciting to see this new decade of the project emerging from the earth as it was, with “el tanque”. You could feel the excitement about the possibilities this might bring for the community, and even though the physical and financial labours to achieve that seem unimaginable at times, it is quite remarkable how their Cuban strength and determination seems to get them through the impossible. I am truly in awe of what these people are able to accomplish with virtually nothing. This year I was asked to create an outdoor art installation in addition to conducting the four workshops I had planned for the week. With technical help from local artists I created a sculptural piece titled “the nest” which was installed on the neighbourhood artists’ boulevard in the centre of the barrio. In addition, four different workshops were conducted this year in order for me to accommodate more children. They created delightful handmade books of various shapes and sizes. We worked at the end of the street at an outdoor recreation centre of sorts. Work also began this week on a block-long fence mural which highlights work by each of the neighbourhood's volunteer artists...again I was asked to participate as the first “honorary artist” of this delightful project. Thanks to the fundraising efforts back in Winnipeg we were able to sell greeting cards to friends, family and others, depicting the art murals in the neighbourhood, and we made enough to once again purchase all of the supplies needed for the workshops but also to be able to leave a suitcase full of art supplies that they could continue to use throughout the year. I have already committed myself to return next April and again I leave in tears, because now I am leaving a whole group of friends and my new Cuban family. The love affair with Havana begins! I arrived in Havana for the first time, and was greeted by 4 basically unknown smiling faces, waving to me as I went through the security doors at the airport. We all jumped into a bright green 1950’s taxi and so began the most amazingly intense week of my life! In addition to helping the artists paint a large residential mural in the neighbourhood, I spent 6 days straight, conducting a free after-school workshop for about 16 children, on altered books. All of the materials used came with me and were provided thanks to the fundraising efforts of young students in Winnipeg. The workshop was conducted on a very hot rooftop but that certainly did not seem to bother any of the children who waited on the curb outside patiently each day after school, for me to call them up. I have never experienced children so eager and grateful for the opportunity to participate in an art class. The week left me in tears each night that I was there. I was physically and mentally exhausted from the intensity of the experience yet I knew almost immediately that I would be returning in the future. The people in this community welcomed me with open arms and hearts, and I only hope that I gave to them as much as I was given that week in Muraleando.